If the crankshaft is frequently called the "heart" of an engine, there is no doubt that the camshaft is the "brain." Its job is to open and close the valves at just the right time during engine rotation, so that maximum power and efficient cleanout of exhaust can be obtained. The camshaft drives the distributor to electrically synchronize spark ignition. Camshafts do their work through eccentric "lobes" that actuate the components of the valve train. The camshaft itself is forged from one piece of steel, on which the lobes are ground. 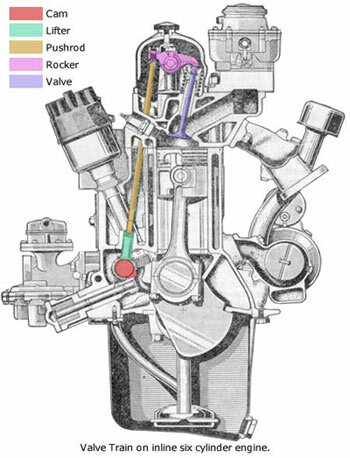 On single-camshaft engines (by far the most common pre-1980 engine) there are twice as many lobes as there are cylinders, plus a lobe for fuel pump actuation and a drive gear for the distributor. 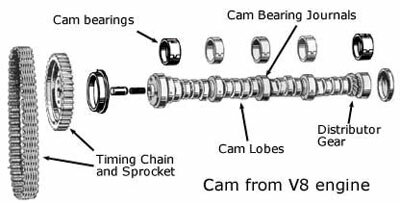 A typical V8 camshaft has five bearing journals to keep it in precise position while it rotates. Driving the camshaft is the crankshaft, usually through a set of gears or a chain or belt. The camshaft always rotates at half of crank rpm, taking two full rotations of the crankshaft to complete one rotation of the cam, to complete a four-stroke cycle. Lifters can be of several types. The most common are hydraulic, mechanical and roller lifters. Hydraulic lifters fill with oil that acts as a shock absorber to eliminate clearance in the valve train. They are quiet and don't require periodic adjustment. Mechanical lifters are solid metal and require scheduled adjustment for proper valve clearance. These are used in high-rpm applications. Roller lifters use a roller device at one end and can be hydraulic or mechanical. They are used in applications where a very fast rate of valve lift is required. So Much For Hardware, How Does It Work? Lash: The clearance between the end of the rocker arm and the tip of the valve stem that allows for thermal expansion of the components. Mechanical lifters typically have lash adjustments between 0.10 and 0.30 inches. Lift: The maximum distance the valve's head is lifted off its seat in the cylinder head. Since lift is determined by cam lobe lift multiplied by the rocker-arm ratio, maximum lift can be carefully controlled or adversely affected by the choice of components. Total lift is the product of lobe lift times the rocker arm ratio. Manufacturers consider a rocker arm ratio of 1.5 to be standard. For example, a cam lobe lift of .500 in a normal engine would result in a total valve lift of .750 (.500 X 1.5 rocker ratio). Valve Overlap: The condition in which, during rotation of the crankhaft, both the intake and exhaust valve in a given cylinder are off their seats. This exists to some extent in all engines because it has been determined that the exhaust valve should open before the piston reaches bottom-dead-center (BDC). Residual pressure in the cylinder pushes exhaust gases into the ports, helping to create negative pressure (vacuum) as the piston continues to push the gases out. This vacuum acts to help draw a little bit of the intake mixture into the exhaust port (due to overlapping valve openings) to scavenge the cylinder. The amount of valve overlap dictates how a specific engine will perform. When valve overlap in increased engine vacuum and cylinder pressure is lower, both of which are undesirable for low end power and driveability. Lobe Separation Angle: The geometric angle between the centerlines of the intake and exhaust lobes. Once this angle is determined it directly affects the amount of valve overlap. If the lobes are moved closer together (lower LSA) the valve overlap increases. Duration: The amount of time (in degrees of rotation of the camshaft) that the lobe holds the valve off its seat. Duration also affects the total lift of the valve because of the inherent limitations to the rate-of-lift of the lifter itself. Duration is generally the most important thing to consider when choosing a camshaft. Rate of Lift: The lobe shape that determines how fast the valve is opened, or how many inches of lift are achieved per degree of crankshaft rotation. Profile: The overall combination of lift, duration and lobe separation angle provided by the camshaft. This is commonly called the cam "grind." With the camshaft and valve train in place we can start the engine. As each lobe touches the lifter, its end rides up the lobe's leading surface. This action "lifts" the lifter and the pushrod, which presses up on the rocker arm. The rocker arm "seesaws" over its pivot mount and its other end pushes on the valve stem, compressing its spring and opening the valve. The valve is fully open with the lifter reaches the tip of the cam lobe, after which it starts closing as the lifter slides down the lobe's trailing edge, pushed by the valve's spring tension. The valve stays closed until the lobe comes back around as the camshaft turns. The point where the intake valve opens is critical to an engine's running properly. If it opens too early, exhaust gases can get forced into the intake manifold (remember valve overlap?) This causes soot buildup on the intake runners, low engine vacuum and low power. If the valve opens too late, less of the fuel/air mixture gets into the combustion chamber and exhaust gases won't be as efficiently removed. If the exhaust valve closes too early the desired "scavenging effect" will be less and some exhaust gases can get trapped in the cylinder. If the valve closes too late an excessive amount of fuel/air mixture will escape into the exhaust port and the combustion chamber will not be optimized. Now it gets even more interesting! While the lobe shapes and valve overlap on a specific camshaft can't be changed, the relationship of the camshaft to the crankshaft can. Once a profile is chosen the camshaft can be custom "tuned" to the overall engine configuration. That is, the relationship of camshaft timing to the crankshaft timing can be changed by installing the camshaft either "on center," (as designed by the manufacturer) or either advanced or retarded from the timing marks on the cam and crankshaft chain (or gear or belt) drives. What does this do? Well, if the camshaft is advanced, the intake valves close earlier in the cycle. This has the effect of increasing cylinder pressure because the exhaust valve closes earlier during the intake stroke. This results in greater low-end torque, but less efficiency at the high end of the rev range. Retarding the camshaft does the reverse, of course. Doing so has the effect of increasing cylinder scavenging, allowing an engine to "breath" better as it revs up. In fact, it allows engines to rev higher. Engines with retarded cam timing make better power at the high end, but lower torque at the low end. Racing engines benefit best from this type of cam timing. Before running out to the garage to degree your cam, take note that your camshaft was probably installed "on center." In practical terms you can only advance or retard about four degrees (crankshaft degrees) either way before you run into trouble, such as piston/valve clearance, pre-detonation or otherwise unacceptable engine performance. As piston speed increases things get really hairy inside the engine. The allowable time a cylinder has to fill, provide power and exhaust is extremely short. We need to do something with the camshaft to compensate for this condition, otherwise the engine will max-out at some intermediate rpm, say around 4500. We can't increase the lobe separation angle because that would cause the valves to hit the pistons. The only thing we can do is increase the time the valves are open in order to let in more fuel/air or let out exhaust. The only way to do this is increase duration and, to some extent, lift. The more aggressive a cam, the greater the duration and lift. Lift is severely limited by the geometry of the engine, especially those that use domed pistons. Also, the lobes themselves must be shaped properly (spread out) or the lifters will not ride on them correctly. Duration, on the other hand, is up for grabs. Cam grinders can create lobe shapes that give long durations, allowing engines to rev well into the 8-10,000 rpm range because they can "breath." Those same engines, however, exhibit very poor running characteristics at low rpm due to low cylinder pressures and vacuum. They "lope" at idle and frequently won't run at all at speeds lower than 1,000 rpm. That leads us to making the right choice for our engine. Since we can't have it all, we have to decide how much performance we need and how much loss of driveability we are willing to give up. Camshafts that were specified by the manufacturer originally ("stock" cams) were chosen to give the best low-end torque and ease of starting and driveability over the widest range of conditions. Higher performance engines were fitted with more aggressive camshafts for throttle response and to create the higher power outputs that the inertia of high rpm generates. Buyers of those engines frequently complained about starting problems, high fuel consumption and having to slip clutches in order to accelerate smoothly from a standing start. When building an engine it is generally wise to install a "mild" camshaft, one that is a step or two up in aggressivity from a stock grind. Such profiles allow crisp throttle response, greater-than-stock power, low end torque and smooth driving characteristics, all at the "cost" of high power output. Going to high duration and lift camshafts will give you greater power (assuming all the other engine components are matched to the cam) but you will experience poor idle, annoying low-speed driving characteristics, vacuum accessory problems and premature wear of alternators, water pumps and air conditioning compressors. All of this is the reason why modern engines utilize variable valve timing devices and why relatively small displacement motors pump out impressive amounts of power. Older engines can't benefit from this technology, so we are left with compromises.